Amber is the last of our three seamstresses sewing knits. Make sure you check out what Meg and Kathy made! Amber did a fantastic job on this post with a lot of great tips and thorough explainations. We asked Amber to make something using ITY Knit. ITY Knit is wonderful not only because it is fashionable and comes in a lot of great prints, but has nice stretch, drape, and is made to be comfortable and breathable. And let's not forget, washable. You can make dresses, tops, leggings, drapey cardigans, skirts, and more. So for the next pattern you use that suggests a light-medium weight knit consider using ITY! Hi! I'm a stay-at-home mom of two little ones after working for quite a few years in a long hours, high stress job as an IT administrator. My mother sewed when I was growing up, however I didn't do much sewing until I was in high school and then only dabbled in a couple projects. Three years ago I lost 70+ pounds after having my second child and decided that rather than purchase a new wardrobe, I would attempt to make one instead. I always enjoyed sewing, I just never thrown myself completely into it and once I started, I haven't stopped. I'm a perfectionist which is both good and bad in sewing but means I usually agonize over the details and make sure things are precise. 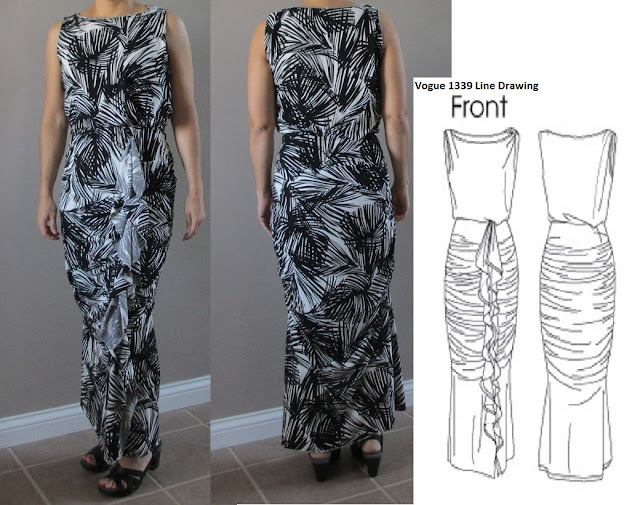 When Fabric Mart Fabrics asked me to demo how I sew with polyester ITY knits, I decided to chose Vogue 1339 as my pattern. The line drawing of this shows a right shoulder pleat, a twist on the left shoulder, a hand-rolled hem around the neck and arms, two bodice pleats, many, many pleats on the skirt, a dart, an underskirt and flounces! Are you serious? Right? Throw in some French seams, and yeah, that wraps it up! To my surprise, this was actually a terrific project to walk through sewing with knits, because I couldn't rely on my serger or coverstitch. 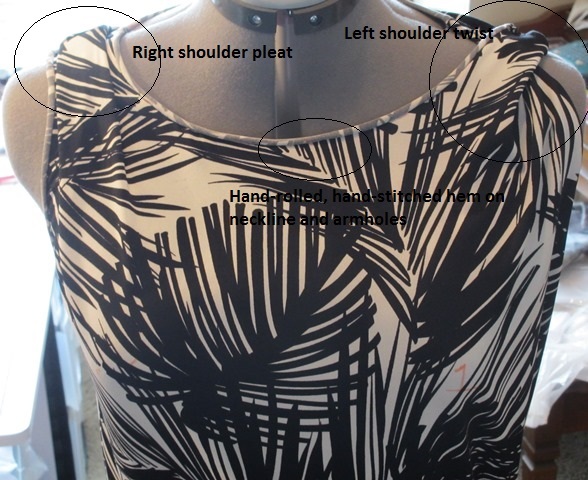 Use finished garment measurements where possible as a guide and in some cases be open to zero or negative ease. A lot of times I will sew a smaller size in knits than what I would make in wovens, but it largely depends on the design of the garment. For the fit on knits, consider that some garments are snug intentionally for support so take this into consideration when sizing. Also for some styles, consider using a lining, especially with thin knits like poly ITY as they can be clingy and revealing with certain designs. This masks undergarments as well as helps the garment hang more forgivingly. In this particular Vogue pattern, the lining wasn't an issue as the pattern includes an underskirt, but this particular pattern must be fitted so that it is snug through the waist/hip/thigh to support the weight of the flounces. I ended up making mine a size too large, because I didn't account for this but was able to make it work by adding elastic to the waist to help account for some of the lacking support which it probably needed any way. I usually use a rotary cutter for polyester ITY knits since they can move around quite a bit on you. 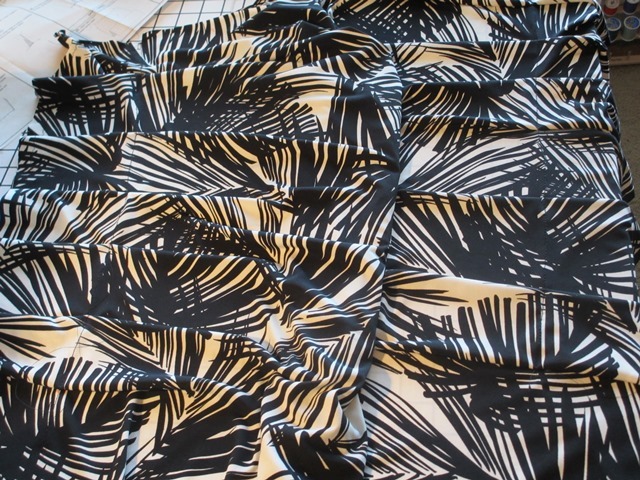 For this particular pattern, I had no choice but to cut it with scissors on my dining room floor because the pattern pieces were so large and required a single layer of fabric. The best thing you can do in this case is use a lot of pins and keep it as stable as possible as you are cutting. Try not to rest or lean on the fabric at all as it will shift, slide and distort grain also try to keep the pins away from the very edge as this can also pull and distort things. For marking, I love Frixion markers (Pilot - thermo-sensitive gel ink). I did also have to use a little tailor's chalk and tailor marks hand sewn in a contrasting thread to mark certain things due to the black portions of my fabric that made it hard to see. I chose a fabulous Maggy London polyester ITY knit print. Polyester ITY is a wonderful fabric however it is deceptively heavy, especially when you get multiple layers and longer lengths of fabric. This should not prevent you from selecting it for your pattern, it just means you have to consider things like stabilization as you go along. 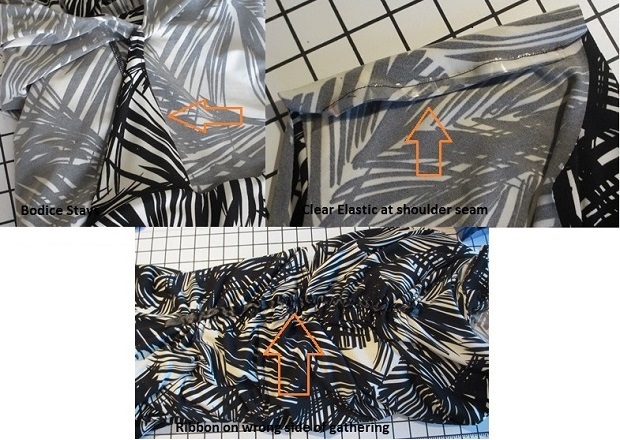 I always stabilize my shoulder seams whether with clear elastic, Stay Tape or even ribbon. On maxi length dresses, I almost always find the need to add snug-fitting elastic at the waist, back or bustline (depending on where the seam is at) to help support the extra weight. On this particular dress, I added clear elastic to the shoulder seams, ribbon to the underskirt behind the gathering permanent stitching, and elastic to the waist in addition to the bodice stays that the pattern included. I made sure my stitch length was in the 2.0 to 2.5 mm range for permanent stitching. I tested a ton before I started, experimenting with various stitch types, tensions, techniques mainly focusing on comparing the straight stitch with stretching versus a narrow zig-zag. I've used the built in stretch stitch on my machine in the past however I would recommend it absolutely last as far as ease of use, end result, look, waviness, etc. I personally found that if the proper technique is applied to stretching the fabric in front of and behind the presser foot, the straight stitch provides the stretch, give and nice look that you need to your seams. I wasn't happy with the narrow zig-zag personally and found it to have less give (assuming you don't stretch it as most people say you don't need to do) but always test with your fabric, thread and tension first to see. Jalie has excellent videos on YouTube and their blog demonstrating their techniques for sewing knits with a regular machine. The best advice I can provide based on my experience is to steer clear of the built-in stretch stitch and play around with the other options to see what works best for you and how it stretches/gives and compares to serged seams. On this pattern, I had to slipstitch the entire length of the armholes and the neckline after doing a hand-rolled 5/8" hem. I used a #9 needle with a single strand of Gutermann and kept my tension taut but with some ease since it does have to stretch and give due to being a knit. 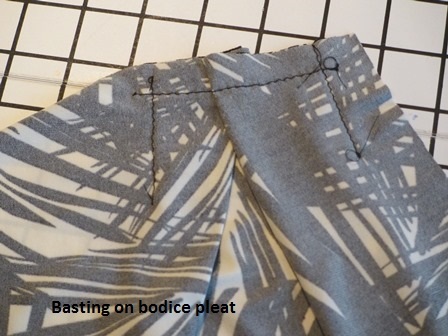 On basting, keep in mind not to loosen your tension too much as it can be too loose by the time you add the extra stretch when sewing if machine basting. I had two darts (underskirt and skirt), two French seams and many, many pleats on this garment (three on bodice and many in various directions on both sides of skirt/flounces). I found the best way to sew these on poly ITY was just to do what you would normally do on a woven except with the straight stretch stitching method I've discussed. Many textbooks I referred to asked for narrow zig-zag/crooked straight stitches on darts however I think this looks a tad messy and given my stretch test results, I opted instead to stick with my tried-n-true. 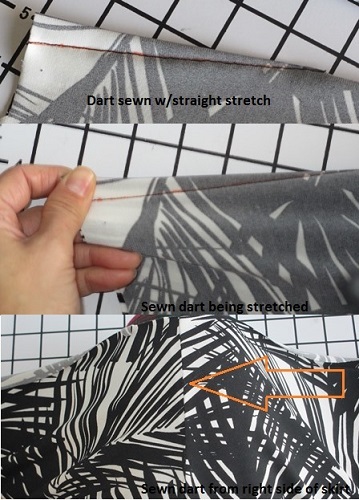 You can see in the pictures of the dart that it is sewn precisely and also has the stretch needed to prevent popped stitches and hold up to wear. I also have pictured the many pleats found on the skirt of this garment which worked well with this stitching method (they hold a lot of weight and need to stretch so a good test). Typically I coverstitch with a 6mm or 3mm on my hems. If I were using my regular machine, I would use a twin-needle. In this particular dress, the flounces and bottom of the skirt is left with a raw edge. Normally I would use my serger to do a rolled/lettuce edge on this but in this case, the raw edges grew on me. I'm not someone who ever leaves edges raw in knits since it always just seems unfinished, but I can say in this particular dress, it fits the style perfectly so I learned to let go. Did you prewash or dry the fabric before cutting? We recommend pretreating/washing and drying any fabric you plan on washing and drying later. As polyester will not shrink as much as a natural fiber, you will still want to wash it first to remove any over-dying to prevent mistakably dying your laundry. Amber here - I have to admit that I almost always prewash and dry my fabric beforehand but for this particular project I did not as I was over-anxious! Polyester ITY (usually being a blend of >=92% poly <=8% lycra/spandex) doesn't shrink much, if at all, however I do find sometimes the dye or even various residues on it. Fabric Mart Fabrics is great however I've bought some from other vendors where it was more critical, I would still say always prewash and dry but yeah, if in a pinch, you can skip it just know it can always backfire.